"I came from a fairly modest background, but I never felt I didn't have a chance in my society... It's never too expensive to give a chance for a decent beginning for everyone." 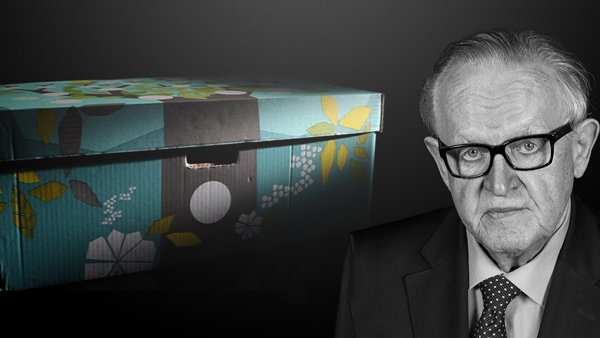 Martti Ahtisaari with the Kela ‘Baby Box’, given to each Finnish newborn from the Finnish welfare system. Fairness and egalitarianism are often absent from the economic policies of governments, but in Finland the government has ensured all children receive a help from the welfare state. In the 1930s, when I was born, child mortality rates were high, so the Finnish government introduced the “baby box” in 1938 to ensure low-income parents could give their children a good start in life. The packages were also a way to improving maternal health. Prospective mothers had to visit a doctor for a check up within the first four months of pregnancy in order to receive the maternity package. This wasn’t the norm in the 30s. The system proved to be so effective that in 1949 the boxes were offered to all mothers, giving everyone this basic welfare package. The box now includes bedding, nappies, socks, towels, bodysuits, mattress and the box itself doubles up as a cot. "With such a positive outcome, the baby box, for me, embodies the egalitarian principles that underpin fairness." Today, Finland has one of the world's lowest child mortality rates, this is in part due to the fair start given to babies at birth. With such a positive outcome, the baby box, for me, embodies the egalitarian principles that underpin fairness. By treating everyone as equals from birth and tending to basic needs of health and education, every child in Finland has benefitted by being given a decent start. Finland is the only country in the world which provides maternity packages to mothers, but there is no reason why systems such as the maternity package should not be brought into other countries. This would be a tangible means of meeting Goal 3 of the Sustainable Development Goals to ensure healthy lives and promote wellbeing for all ages. And that’s what fairness means to me. Join in the conversation by posting a picture of an object that represents fairness to you to our Facebook or Twitter using the hashtag #ObjectOfFairness.